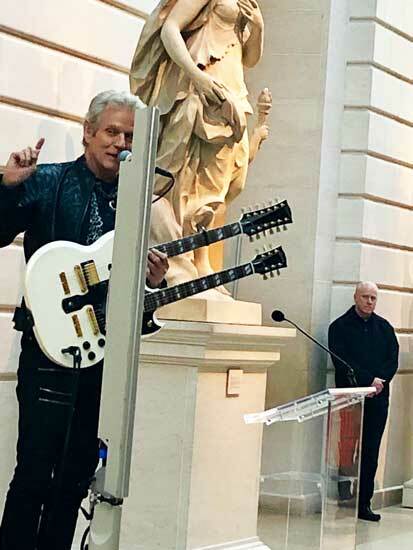 The Eagles may have booted Don Felder out of the band, but he was the one who enjoyed a star turn at the Metropolitan Museum’s memorable press preview for Play it Loud: Instruments of Rock & Roll, which opened yesterday (to Oct. 1). 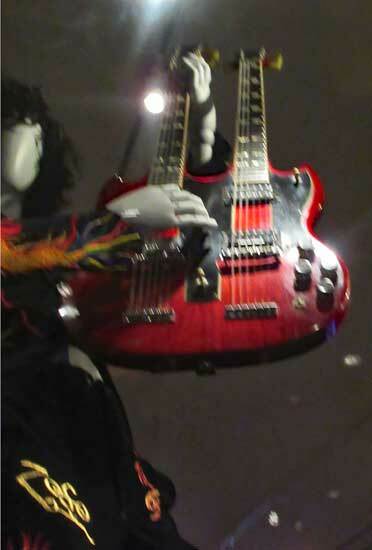 Following comments by several rock luminaries (see below), Felder strolled up to the microphone, picked up his trusty double-neck sidekick, and treated us to a bravura performance (backed by a recorded track) from the song that he can put aside any time he likes, but can never leave. 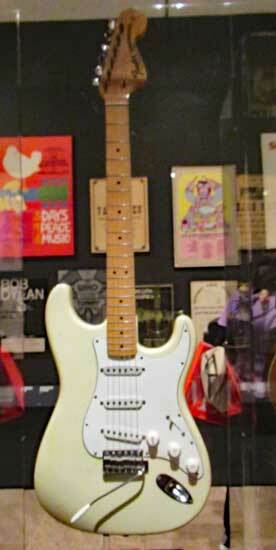 Although the lead vocal on the original recording of “Hotel California” was by Don Henley (who co-wrote the lyrics with the late Glenn Frey), it was Felder who wrote the music and played lead guitar. (He did fine on the vocals at the Met.) 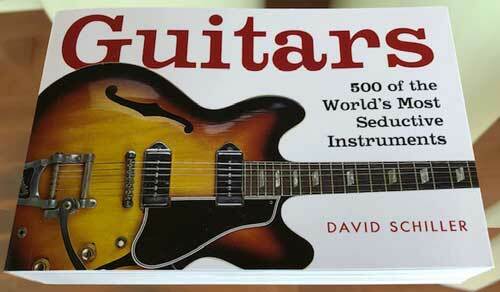 It’s one of those perennials that make every crowd go wild when the first notes are sounded. Even the sedate press got into it. He didn’t really rock out, though, until he finished the (abridged) vocals, switched to the lower neck of his instrument, and played the hell out of it. I was planning to take you to this Great Moment in Press Preview History with my own CultureGrrl Video, but YouTube blocked it as a copyright violation [?!?]. Sympathetic to my plight, the Met allowed me to use its own video (at the bottom of this post), which has the advantage of much better sound quality. 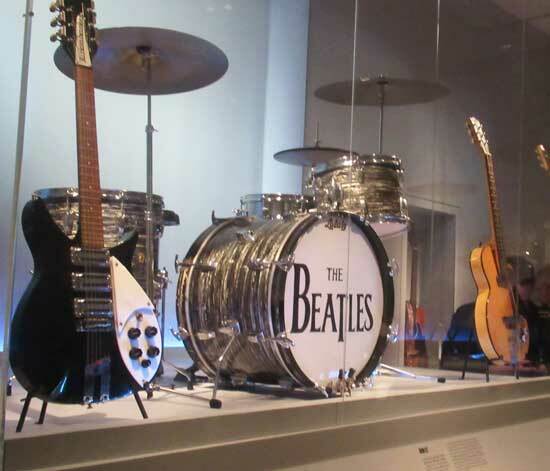 If I come off more like a fan than a critic, that’s in keeping with the spirit of the Met’s exhibition, which seems a better fit for the Rock & Roll Hall of Fame, Cleveland (where it makes a road trip in November), than for a scholarly institution. 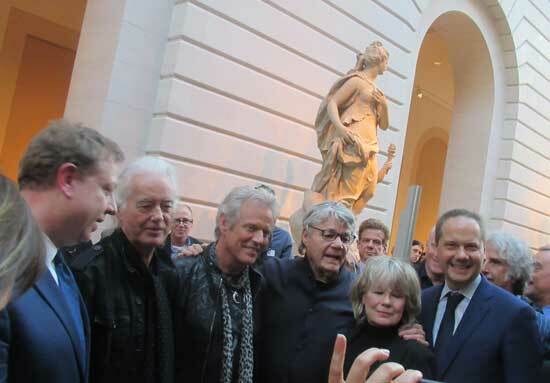 The show was co-curated by the Met’s Jayson Kerr Dobney and the Hall of Fame’s Craig Inciardi. 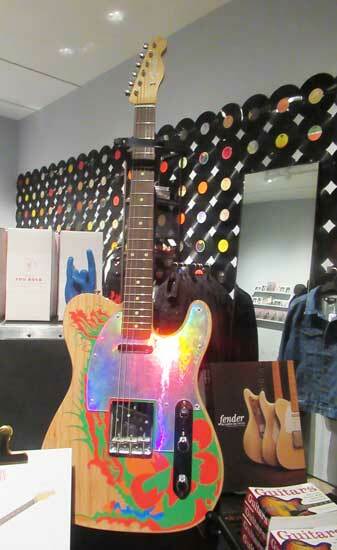 Other progenitors represented by their guitars include Muddy Waters, Bo Diddley and Elvis. But where was B.B. King‘s “Lucille” when we really needed her? 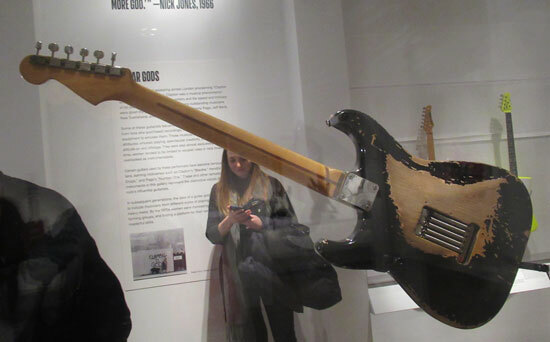 Looking around at my press-preview colleagues, I ruefully realized that I was one of the few dinosaurs roaming the galleries who had actually sung along with the progenitors’ songs (with the exception of Muddy Waters) on radio and TV, when they were excitingly fresh, not relics. 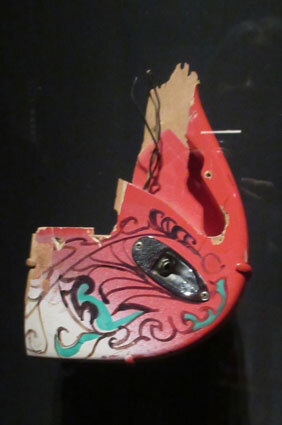 The label for Chuck-plucked guitar is a great improvement from earlier text that had been posted in our press kit. 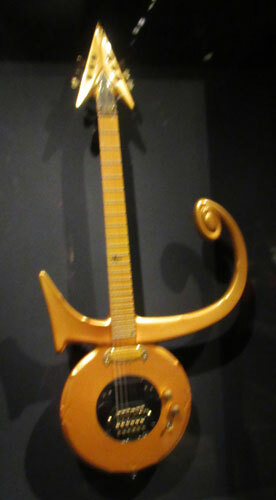 It provides the kind of detailed information about the instrument’s sounds and how they were produced that seemed wanting from much of this starstruck show. 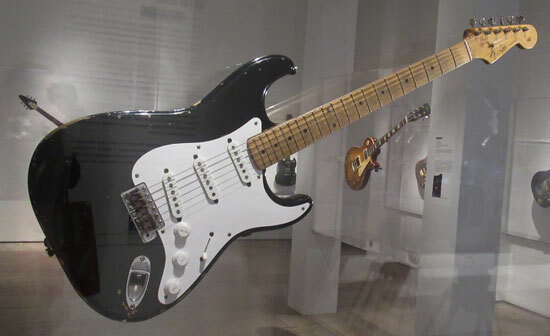 An electric guitar’s pickups use an electromagnetic and wire coil to transmit the vibrations of steel strings to an amplifier as electrical signals. 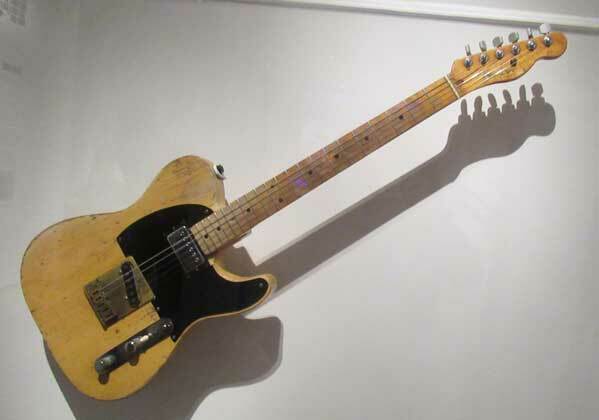 This example is from 1957, when Gibson introduced…humbucking pickups, which have two coils with currents running in opposite directions, canceling (or bucking) an electrical hum that the earlier single-coil pickups could produce. Feeling a need for more information about the instruments themselves (as distinguished from their famous owners), I wished I had been accompanied by my California kids—acoustic-engineer CultureDaughter (who understands the interplay between electronics and sound) and her mechanical-engineer husband, who understands guitars’ underlying gadgetry and moonlights as a rock-guitar player. In lieu of a more conventional birthday present this month, I contributed (at his request) some funds for CultureSon-in-Law‘s planned creation of a personal recording studio. 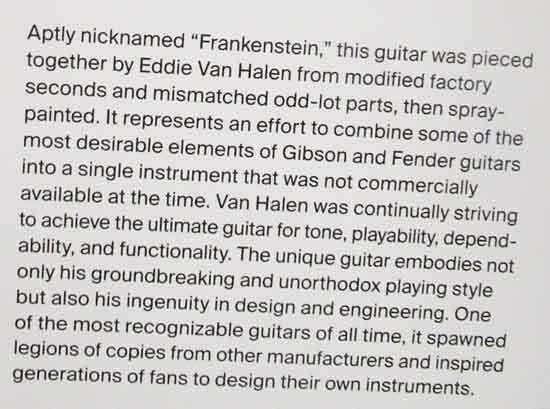 According to its label, the “Frankenstein” is composed of: “contoured ash body, maple neck, 25 1/2-inch scale, PAF humbucking pickup at bridge, dummy neck pickup, single volume control, Floyd Rose locking vibrato system, 1971 quarter” [huh?]. 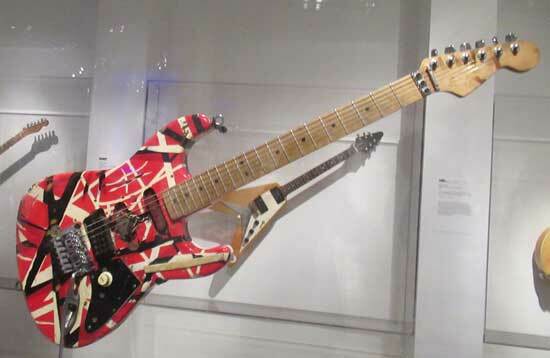 We got a breathtaking look at Eddie’s “groundbreaking and unorthodox playing style” in one of the short videos on view in the show’s most engrossing gallery, where he and several other brilliant guitarists (including Keith Richards), discussed their instruments and their craft, and played a few riffs. 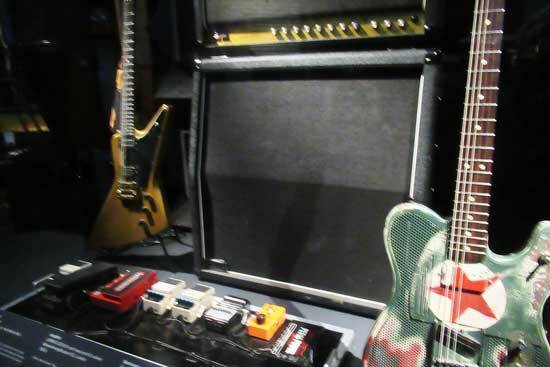 Also on view were the actual rigs that they engineered to get the sounds they wanted. 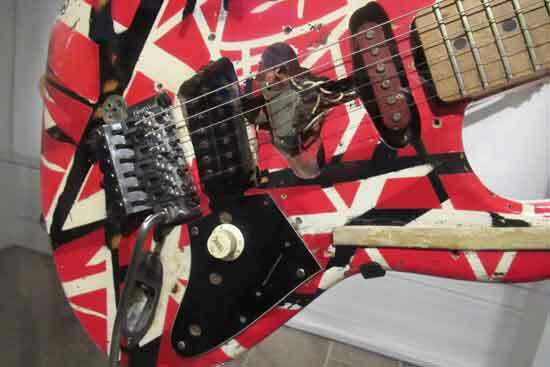 Although the show is ostensibly about all the “Instruments of Rock & Roll,” the vast preponderance of objects in “Play it Loud” are guitars, and the stars of the show are the virtuosos of that instrument (i.e., Van Halen and Richards), not the frontmen (i.e., not David Lee Roth or Mick Jagger, who was in the news on the day of the press preview because of a then unspecified medical problem that forced the postponement of the Rolling Stones tour). 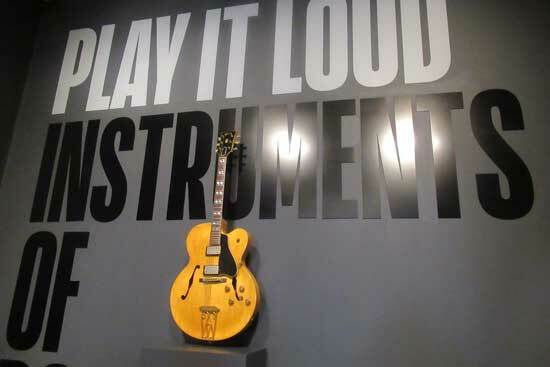 There’s something sad, though, about seeing relegated to silent, static display all these instruments that once came thrillingly alive in the hands of their famous owners. But enough with nostalgia. Let’s get down with Don, who will not be part of the reconstituted Eagles’ upcoming first-ever concert performance of the entire “Hotel California” album (in Las Vegas, not California), but can take some comfort in yesterday’s release of his own new album. At the end of this clip (which may bear ads ads placed by the copyright owners on YouTube, which was the source of my embed code), you’ll hear Met director Max Hollein exult that “this was probably the most amazing press conference that we’ve ever had!” Max hasn’t been at the Met long enough to say that, but I’ve been attending Met press previews since the 1970s and, yup, he’s right!